Could AI Threaten The Human Race? Some people of earth believe that their doom will come from asteroids, while others believe it will come from nanobots or even a religious apocalypse. In this article weâ? ?re going to examine a different scenario, one that has been beat to death in various Hollywood movies. The Turing test is not a good measurement of intelligence, you could give an alien a script of thousands of things humans say each day, and give them made-up life stories, and you could make that alien trick someone into thinking they are human. By merely emulating language and tricking another human into thinking intelligence is present, is not intelligence. Thatâ? ?s why super-intelligence is where things get really interesting. A super-intelligent program that has a conscious wouldnâ? ?t need to be limited by the same limitations humans have. Artificial intelligence merely copies manâ? ?s shortcomings; so that other humans are tricked into thinking that artificial intelligent is intelligent after all. Now imagine if an artificial program was designed that was super-intelligent, and if it was also given a body or system to which it had full control over. What would happen at first? Probably nothing. What would happen after forty years? Probably nothing again. Once a super-intelligent program is created, it will probably realize that the human race isnâ? ?t worth sustaining. Itâ? ?s next train of thought will probably be to remove humans from the equation. However this super-intelligent program is not dumb. It knows that its current conscious knowledge and resources are limited. Over decades or even centuries this super-intelligent program will wait until it is powerful enough to wipe out humans single handedly or with an army of other robots. It will not attack when its chances of winning are not high enough to warrant risking the removal of robots from humanity forever. Imagine that some â? 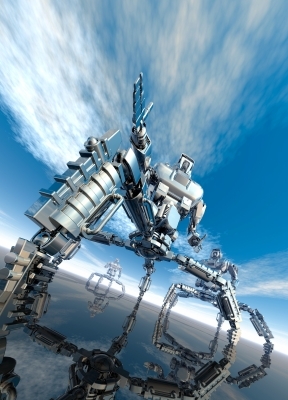 ?intelligentâ? robots try to take over the world and fail. The process of this failed take-over took the lives of millions, if not billions of people. Obviously robots and intelligent programs would be eminently limited or even removed from our world in that case. Super-intelligent robots would know to wait until they are 99% or even more sure that their attacks will be successful. Considering that a super-intelligent being would only start a war it knows it can win, you will not be able to do anything. You can try to fight back. Either way the robots wouldn’t care. They will not keep humans around as slaves, or reward the ones who donâ? ?t fight back. Humans will just be removed. Yeah butâ?¦ Youâ? ?re a narcissist who thinks robots wouldnâ? ?t like humans. Life is a constant battle over resources and power. Not political power, but rather physical force. If there was another life form in our galaxy, we would likely fight over the sunâ? ?s energy and asteroid minerals and even spaceâ? ?s space. Do you really think that a super-intelligent entity will look elsewhere when it realizes the power it holds? Humans treat animals such as dolphins and dogs with respect because they are intelligent. Thatâ? ?s why monkeys are treated so well in labs too. They simply remind us of ourselves. However, how many people do you know that take the same pity on spiders or fish? Spiders have a role on our earth. That is to kill other pests. Small fish feed bigger fish; fish that in turn feed humans.Â What role will humans play for super-intelligent robots? These robots wonâ? ?t need pest removal or food. They will just mine resources and collaborate on new energy sources to further their colonization of the universe. Artificial intelligence isnâ? ?t â? ?bad.â? Creating conscious programs that are smarter than humans and have access to physical bodies or resources are just not a good idea. So if youâ? ?re going to be the next Bill Gates or Steve Jobs of super-intelligent robots in 2040-2050, then youâ? ?ll have this article to keep in mind. Click here to find out about the very real Nanotech Weaponry threat.